Perhaps the most important part of an illuminated saber is its blade. And yet, the technology of the blade itself is too often overlooked or taken for granted. Many consumers and sabersmiths alike spend their time worrying about lumen ratings, wavelengths, and other aspects of the high-powered LED that serves as the saber's light source. And while the LED is indeed critically important, the blade that carries its light is perhaps just as important. Put simply, the best LED in the world is worthless if the saber's blade can't properly diffuse its light. So at Saberz.com, we spent a lot of time refining our blades, looking for the perfect balance of diffusion, translucency, evenness, and that undefinable characteristic that just makes a saber blade look "right." Rather than offer a half dozen options of blades that are all mediocre, we spent our time developing that one perfect blade, and that's what we sell. Just one option, and it's awesome. Our first effort was called the Z-Blade. But after years of refinement, prototyping, and optimization, we are proud to unveil the next great blade. This page is all about the result: the Starlight Blade. We're going to tell you all about how it was developed, how it is constructed, and what it means for your saber. The first step in the blade-construction process was to decide whether the blade would be based on a clear tube, or a translucent white tube. 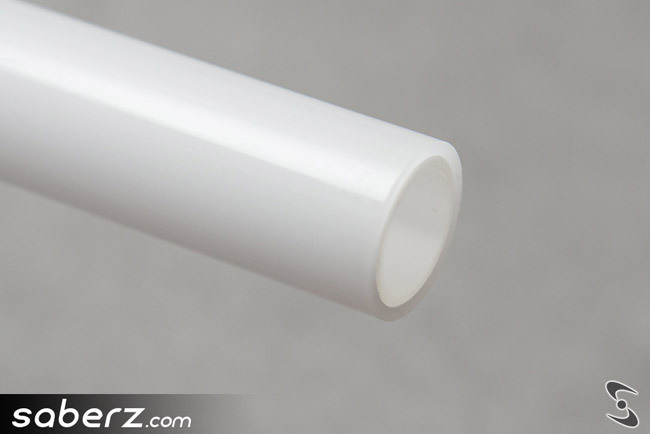 The advantage of a trans-white tube is that it inherently provides excellent diffusion, and can produce very even light all by itself. Previously, trans-white blades had a disadvantage of washing out the colors. However, the particular material used in Starlight does not have this drawback. Colors are pure and vibrant, both in person and in video/photography. 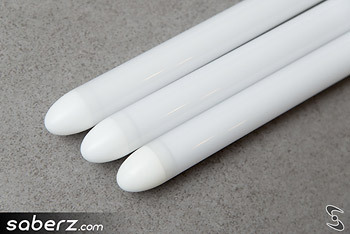 Starlight does not produce the same 'core' look as a clear blade material, but produces far more even light, and is brighter throughout its length. And just to be clear, our blades will fit in any blade holder designed for a 1-inch blade. Another important aspect of the Starlight Blade is its wall thickness. Traditionally, sabersmiths have sold two versions of their blades: a "thin-walled" version at 1/16 inches thick, and a "thick-walled" version at 1/8 inches thick. These translate into approximately 1.5 and 3mm walls, respectively. However, each version represents a compromise. The "thin-walled" blades lighter, and have a larger interior cavity, making them better at diffusing light. On the other hand, the "thick-walled" blades are substantially more durable, but they are also twice the weight, and due to their smaller interior cavity, generally do a poorer job of diffusing light. 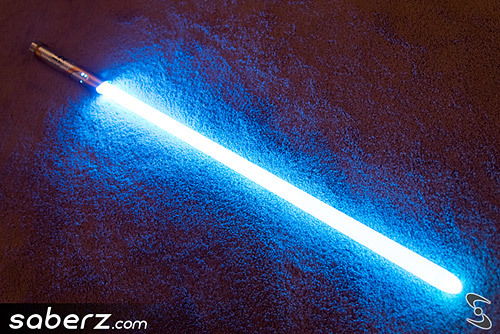 The Starlight Blade's primary method of diffusing the saber's light is by using a translucent film wrapped on the inside of the blade. There have been many types of films used by different sabersmiths, each of which has a slightly different opacity and unique light-spreading properties. The film we use at Saberz.com has extremely low opacity; it's almost completely transparent. That means that in order to achieve the right level of diffusion, we need to use a lot of film. But that's a good thing. It's a very good thing, because it means the ultimate characteristics of the blade can be fine-tuned with incredible precision. Each Starlight Blade uses a whopping twenty-six layers of film to create the perfect, evenly-lit blade. Just a little more or a little less film would result in lower-quality light. Our film also preserves excellent color saturation, and doesn't wash out the color as trans-white blades can do. 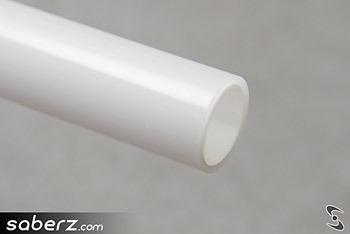 The second method of diffusion is, of course, the translucent white blade stock. It provides a near-perfect conduit for the LED light to spread evenly and efficiently over the length of the blade. We preserve as much light as possible, so that every last lumen of light-blasting capability goes into creating a blade, rather than getting sucked up by diffusion material. The combination of our film and blade stock, and the careful fine-tuning of each, is the secret to creating the perfect saber "look." But that's not quite the end of the story. Finally, we come to the end of the blade, both literally and figuratively. Traditionally, two options have been available for blade tips. The most common is a simple hemisphere, which creates a perfectly round end to the blade. A slightly newer alternative offered by some vendors is what's called a "bullet tip," which terminates in something of a sharp point. Neither of these seems like the ideal shape, so naturally, we decided to manufacture our own. The result is what we call our Hybrid Parabolic Tip. This tip is our attempt to use the best aspects of all others. They are machined from solid polycarbonate into a completely custom shape that merges the traditional hemisphere with the bullet tip. It's round at the end, and has no sharp points. These tips are machined specifically for Saberz.com, and can't be found anywhere else. They are machined to perfectly match the Starlight Blade's tube stock, and won't fit in other blades. 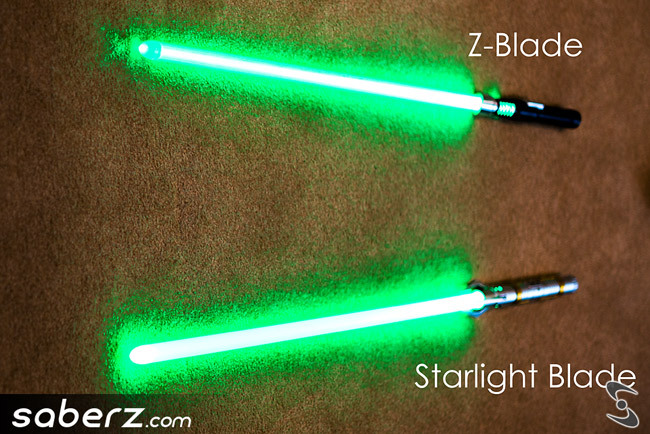 In the development of Starlight, we made significant revisions to this tip compared to our previous Z-Blade. This included an increase in the shoulder depth, as well as unique shaping of the shoulder that improves tip retention. So duel as hard as you like, these tips love to stay on. Moreover, the interior shaping of the tip was completely changed, in order to provide perfect tip illumination while still reflecting light back down the saber for improved evenness and brightness. We went through several dozen different prototypes, changing the style and shape of the interior reflective surface, experimenting with different shapes and sizes of the interior features, and finally arrived at the perfect combination. Our Hybrid Parabolic Tip lights up evenly and completely, without sacrificing any of the blade brightness. It's a quantum leap forward compared to our previous efforts, and one more feature that sets the Starlight Blade apart from the competition. The Starlight Blade is available exclusively from the Saberz.com Store.